Dennis has been in our labo for two years. He did a nice piece of work on platelet functions and lipid mediators. We have learned a lot from Dennis, not only Englich, but also critical evaluation of data, clinical implication of the results, and the beautiful way of expression of the work etc. He was liked by many, and although he did not understand Japanese, he appeared to smell the atmosphere and critical issues in the labo. His presence somehow stimulated others, and at the same time relaxed them. 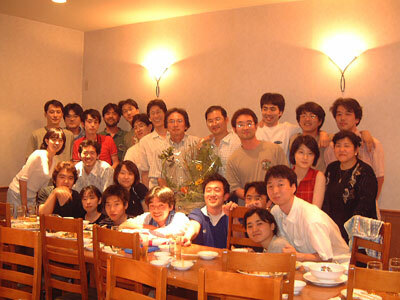 Farewell party was something quite extraordinary. 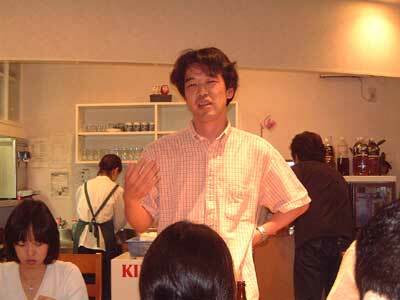 Many students have given a short speech for him, in his/her broken English. 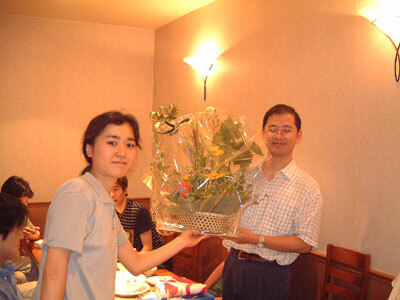 He received a nice present of the memorial tie of the U-Tokyo, and beautiful flowers. Dennis has got a job at University of Chicago, with 50% clinical and 50% research. We all wish his success in the States, and we really miss him and his family.